Need EmergencyPlumbing Service?Call now... we'll be right over! A pro will recommend the best size and type of water heater for your home, so you can save money on energy costs AND have plenty of hot water for your household. A pro will give you access to the best brands and models, some of which are only sold to professional installers and are not available at retail stores. A pro will handle the permit for you. 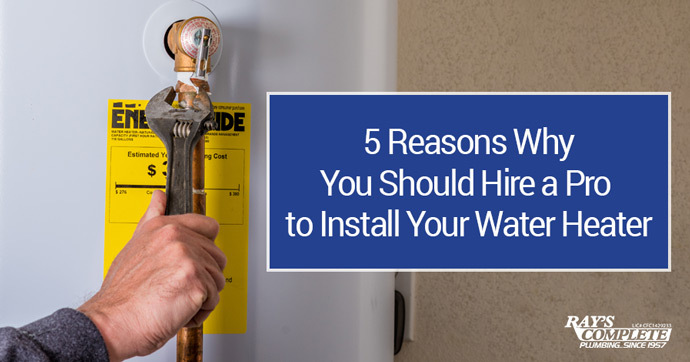 (Yes, most areas require a permit to install a water heater — even if you decide to do it yourself). An experienced pro will install your water heater correctly and safely, the first time – saving you time and hassle. A pro will troubleshoot issues with your current heater. A simple repair may keep you from having to replace your water heater at all. Do you live in Charlotte County or Sarasota County? Get a free quote on a new water heater installation. Please fill out the details below and we will contact you shortly. Buying a new water heater? Use our free calculator to estimate your energy savings! Thank you for voting us the best plumbers in Charlotte County 14 times since 2001! Ray's Complete Plumbing Call Us Today! We'll Be Right Over. © Copyright Ray's Complete Plumbing, 2019. All Rights Reserved.